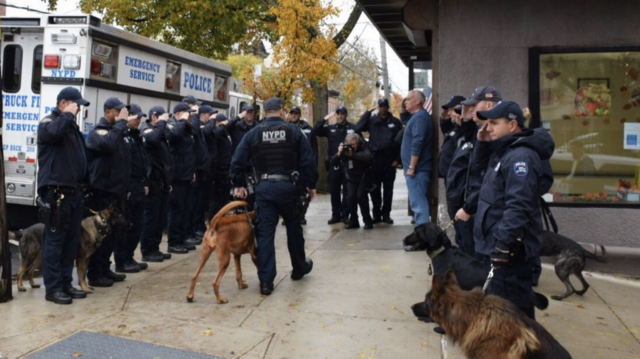 NEW YORK – NYPD says goodbye to one of their beloved K9’s due to cancer. 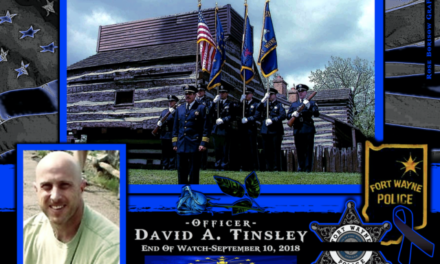 The police department gathered about 20 saluting officers and held an aviation flyover to honor an Emergency Services K9 just before she died. The New York Daily News reports the 5-year-old bloodhound named Angel was diagnosed with cancer in August. She was honored on Monday as she took a final walk into Staten Island’s Rosebank Animal Hospital to be euthanized. In her time with New York’s finest, Angel helped find missing autistic children and track down crime suspects. As a result, she received an American Kennel Club award for her service. Her handler, Officer Manuel Orellana, says Angel also enjoyed some typical dog mischief while off-duty. Her tracking skills were noteworthy. “(Angel) found a big time perpetrator over a two-mile track,” her handler recalled. Lt. Richard Sanossian also remembered Angel as a special talent when it came to tracking. While bloodhounds typically search fields and dirt, Angel’s assignments frequently included an added degree of difficulty. “This dog is tracking on asphalt in an urban environment, which makes it even harder,” he said. K9 Angel was humanely euthanized on 11/5 due to an aggressive cancer. As K9 Angel took her final walk, her sister K9 Lulu was able to bid farewell. With cops lined up, a flyover by aviation, K9 Angel was given a final farewell fit for a hero. Like most K9 handlers, Orellana lost more than just a partner Monday. He and Angel lived together in their Farmington, Long Island home. Sanossian said Angel was given months to live after the cancer was discovered and responded well to chemotherapy treatments before things took a bad turn last weekend. Also bidding farewell to the four-legged hero on Monday was her sister LuLu, who joined the force with her in Jan. 2017. Angel and LuLu were named in honor of fallen detectives Rafael Ramos and Wenjian Liu, who were fatally ambushed in their squad car in 2014 while on patrol in Bedford-Stuyvesant, Brooklyn. Angel’s name refers to Ramos’s faith — he was deeply involved in his church, say fellow officers. Lulu took her name from Lu’s last name. Though Ramos’ widow Maritza never met Angel, other members of the fallen officer’s family had. Sanossian said they opted not to attend the dog’s farewell because it would be too emotional. Her spirit lives on at the Instagram account @k9.angel .